Luxury Villas Mykonos. 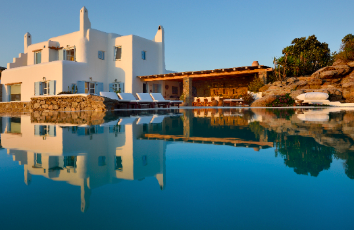 We’ve selected our handpicked luxury villas in Mykonos to suit your travel style. Bespoke luxury services and experiences, covering your every wish (24/7 personal concierge). Luxury Villa in Mykonos. 10 bed Villa in Kanalia, Mykonos. Sensational stay with its sublime architecture, gorgeous view of the Aegean. Luxury Villa in Mykonos. 6 Bed Villa Aleomandra situated on a hillside overlooking the Aegean and the island of Delos is an exceptional holiday villa. Luxury Villa Mykonos. 4 Bed Villa Virginia uniquely located on a hilltop above Ag. Stefanos bay with amazing panoramic views of the Aegean Sea. 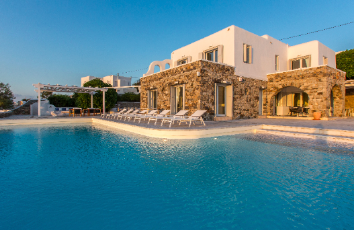 Luxury Villa M in Mykonos is a 2 floor villa with 3 double bedrooms, 1 Guest House, 1 single bedroom and a private gym. An Oscar-winning experience for those who compromise with nothing but the absolute best. Lifestyle Mangement Services, Party and Event Planning, Personal Security Services. Your Personal Concierge will be 24/7 at your service covering your every wish. Mykonos is famous for its intense & glamorous beach life. Our lifestyle Managers will make VIP entrance arrangements for you and your group. Exclusive Concierge Services in Mykonos, Greece. Whether you're looking for a private chef, luxury catering or a formal dinner our chefs brings the restaurant experience to your villa or yacht, making your event more exclusive and private. Luxurious Wellbeing, Private Pilates and relaxing Yoga sessions in Mykonos. Luxury Retreats, Personal Trainer, Fitness, Aquafitness and Aerial Yoga offering unique classes. Every spa and wellness escape is perfectly-suited to satisfy all your vacation relaxation desires. Mykonos private driver, chauffeur and limousine services. 24/7 private driver service in Mykonos. Helicopter charter, Motor Boat and Yacht Charter, Luxury Car Rental Service. Have a luxury ride from a chauffeur driven car in and around Mykonos. Chauffeur driven car hire services for Airport Transfers, Events, Mykonos VIP Nightlife, Private Tours. Leisure or Sport And Adventure Activities. Unique architecture and fascinating arhaeological sites, Jet Skiing, Diving, Helicopter Tour, Wind-Surfing, Luxury Yacht Tour, Excursion to Delos, Rhenia, Tinos, Santorini Island.